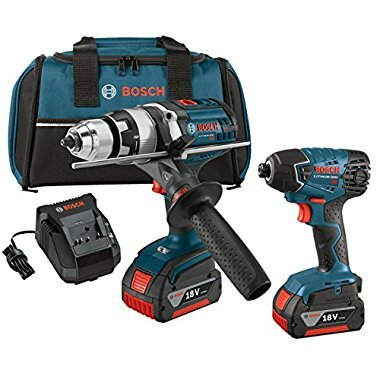 The new Bosch CLPK222-181 18-Volt Combo Kit includes the HDH181X Brute Tough hammer drill with Active Response Technology and 25618 impact driver. Reduce the risk of injury from kickback or bind-up situations with Bosch Active Response Technology featured in the new the Bosch HDH181X 18-Volt Brute-Tough 1/2-Inch Lithium-Ion hammer drill/driver. The innovative on-board acceleration sensors automatically shut the tool down when a potentially dangerous torque reaction occurs. The Bosch engineered 4-pole motor provides 752 Inch/lbs of torque, making it powerful and efficient for drilling a broad range of high torque bits such as spades and augers. As with all Bosch best built cordless tools, advanced electronic motor and cell protection help prevent overheating and overloading for extended tool life and runtime. A built-in LED light illuminates the workspace for optimal visibility. All-metal Bosch gears and Durashield tool housing hold up in even the toughest jobsite conditions, including withstanding multiple 12-Foot drops onto solid concrete. The HDH181X is compatible with all Bosch 18-Volt Lithium-Ion batteries and chargers for maximum versatility. Bosch 18-Volt batteries feature cool pack technology, which integrates advanced heat conducive housing to keep the battery cooler and extend the life. The kit also includes the 25618 1/4-Inch impact driver. The Bosch 25618 impact driver offers the most compact design for increased maneuverability in tight spaces and extended comfort. The 1/4-Inch impact driver provides 1500 Inch/lbs of torque for heavy duty fastening and features a high performance motor that delivers 2800 RPM and 3200 BPM. The CLPK222-181 Combo Kit Includes: (1) HDH181X 1/2-Inch Hammer Drill/Driver, 25618 1/4-Inch Hex Impact Driver, (2) 18-Volt Lithium-Ion Batteries, (1) Charger, (1) Auxiliary Handle, (1) Belt Clip, (1)Magnetic Bit Holder, (2) Screwdriver Bits and (1) Carrying Bag. Bosch 18V 4.0 Ah Li-Ion Hammer Drill / Impact Driver Combo Kit CLPK222-181 New -- Authorized Seller. Full Warranty. Money Back Guarantee. Bosch 18V Li-Ion Hammer Drill / Impact Driver Combo CLPK222-181 Reconditioned -- Authorized Seller. Full Warranty. Money Back Guarantee. 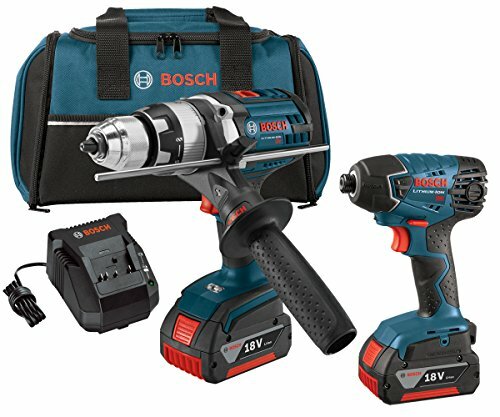 Bosch CLPK222-181 18-Volt 1 / 2-Inch Hammer Drill Driver and Impact Driver Set -- Authorized Bosch Dealer + Full Factory Warranty!!! Store: East Coast Plumbing Supply Condition: Brand New Price: $888.00 Total Price: $888.00 Buy It from East Coast Plumbing Supply Want it delivered by Friday, April 26? Choose Standard Shipping at checkout. Store: Specialty Diamond Condition: Brand New Price: $384.59 Total Price: $384.59 Buy It from Specialty Diamond Want it delivered by Tuesday, May 7? Store: smdbrokers2-us Condition: Brand New Price: $285.99 Total Price: $285.99 Buy It from smdbrokers2-us No returns. Store: solsomaha Condition: New (Open Box, or other) Price: $169.95 Total Price: $169.95 Buy It from solsomaha No returns. Store: Supply Cart Condition: Brand New Price: $497.90 Total Price: $497.90 Buy It from Supply Cart Want it delivered by Tuesday, April 30? Store: sabrastuff Condition: Brand New Price: $209.99 Total Price: $209.99 Buy It from sabrastuff No returns. Store: MARTAN edifice Condition: Brand New Price: $296.99 Total Price: $296.99 Buy It from MARTAN edifice No returns. Last updated: April 18, 2019 at 11:30 EST. Pricing information is provided by the listed merchants. GoSale.com is not responsible for the accuracy of pricing information, product information or the images provided. Product prices and availability is subject to change. Any price and availability information displayed on amazon.com or other merchants at the time of purchase will apply to the purchase of the product. As always, be sure to visit the merchant's site to review and verify product information, price, and shipping costs. GoSale.com is not responsible for the content and opinions contained in customer submitted reviews. Coupon Details: Get this special price with $20 off automatically when you add this item to your cart.